Enhance your bird garden with exciting shape and color using this Heartwood Turquoise Mod Pod Bird House. The deeply curved side, level base, and generous metal roof create a striking roost, while the soft blue finish brings surprising color to your yard. Lines throughout the cypress body offer an aged and textured look, and the tall design ensures the nest remains well ventilated. A 1.375" diameter entry hole near the center of the unit allows small songbirds to enter it, and the wide bottom offers plenty of space for a nest. The bold roof extends past the home on each side, protecting the interior from rain, and a drainage hole on the base helps any water exit from the piece. Place this home on a hook or branch using its attached, black powder coated hanger, and remove the back disc for nest checks or seasonal cleaning. The cypress body forms a durable piece, and the turquoise finish brings vibrancy to any setting. 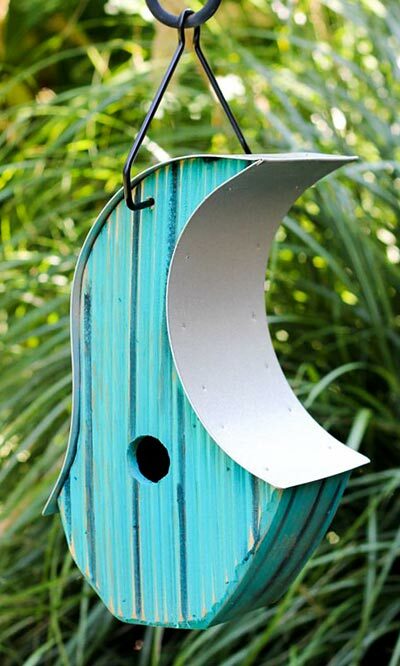 Offer birds a contemporary roosting spot with this Turquoise Mod Pod Bird House. Made in the USA. Circa Modern Plant Hook, Chrome, 24"